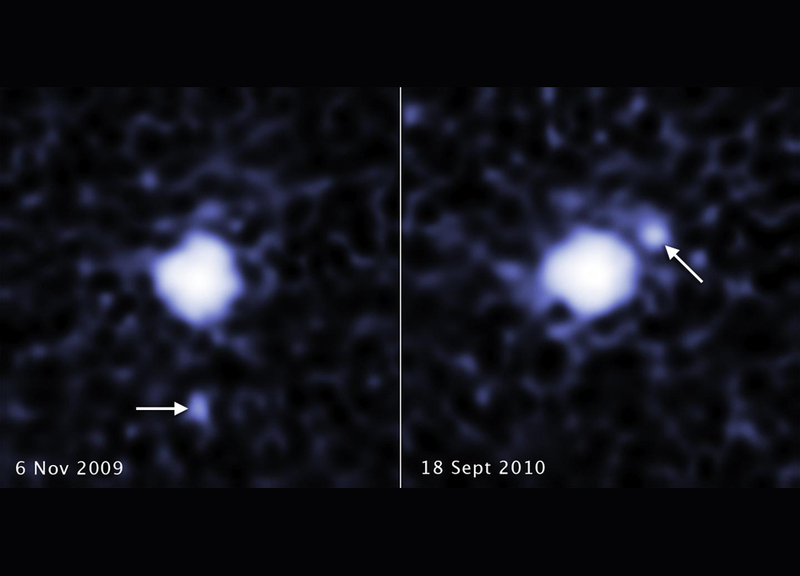 The combined power of three space observatories, including NASA's Hubble Space Telescope, has helped astronomers uncover a moon orbiting the third largest dwarf planet, catalogued as 2007 OR10. The pair resides in the frigid outskirts of our solar system called the Kuiper Belt, a realm of icy debris left over from our solar system's formation 4.6 billion years ago. "The discovery of satellites around all of the known large dwarf planets - except for Sedna - means that at the time these bodies formed billions of years ago, collisions must have been more frequent, and that's a constraint on the formation models," said Csaba Kiss of the Konkoly Observatory in Budapest, Hungary. He is the lead author of the science paper announcing the moon's discovery. "If there were frequent collisions, then it was quite easy to form these satellites."